A few days ago Roccat announced its own in-house mechanical keyboard switch design, the Titan switch. 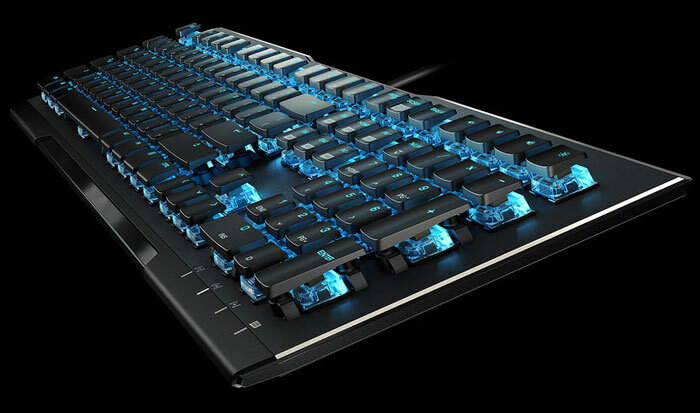 I guessed it might feature in a new product at Computex 2018, and today such a product has been announced - the Roccat Vulcan mechanical gaming keyboard. Before we start to look more closely at the keyboard, it is worth doing a recap on the Titan switches. These are 100 per cent in-house designs, claims Roccat, with an eye on the requirements of PC gamers. According to the firm the Titan switch is both more swift and precise with a tactile but quiet character (it sounds like the closest Cherry equivalent is the Brown MX). Roccat says that major design optimisations include a tactile 1.8mm actuation point, debounced switch contact, reinforced transparent housing and tuned firmware. "All combine to create the most responsive and best-feeling key stroke ever," is the gestalt impression a user should feel. "The most important thing about a mechanical keyboard are its switches, we wanted to showcase them," said Andreas Jost, Head of Industrial Design at Roccat Studios. 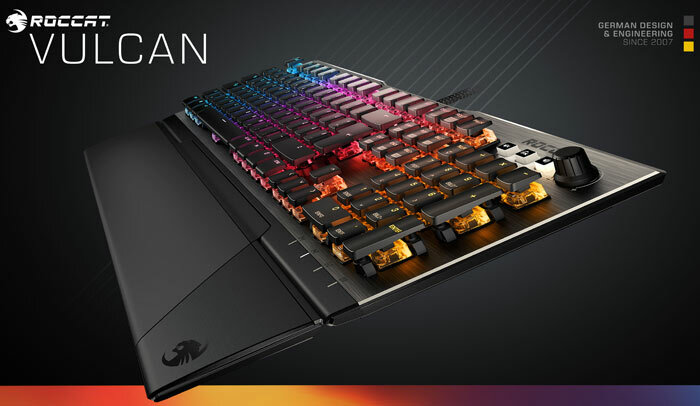 With its "20 per cent faster" keyswitches ready, Roccat decided to make the first Titan-packing keyboard a premium product. Signalling this from the outside is the anodized aluminium top plate, which additionally offers a robust and durable structure. Furthermore, "professional grade mechanical media controls" are said add to the impact and appeal of the overall design. Another thing you will see from the outside is the per-key RGB illumination powered by and synchronised with Roccat AIMO. The lighting is particularly bright, if you wish, thanks to the Titan keycap design (these keycaps are also 50 per cent lighter than the industry standard). If you aren't interested in RGB lighting, a person described by Roccat as a "no-nonsense gaming purist", there is the cheaper Roccat Vulcan 80 keyboard with simple blue backlighting. I've noticed the Vulcan 80 also features a different media control array - no knob, only keys. As well as the Vulcan 80, mentioned above, there is the Vulcan 100 AIMO and the Vulcan 120 AIMO to choose from. These AIMO keyboards differ only by the inclusion of a detachable wrist rest. Roccat says that the three different models will be available at the following prices from the Roccat Shop and from Amazon: the Vulcan 80 at 129.99, Vulcan 100 AIMO at 149.99, and the Vulcan 120 AIMO at 159.99 (Euros / US Dollars). Over at the Roccat shop for UK residents I saw these keyboards listed for pre-order at £119.99, £139.99, and £149.99 respectively. So actually another design Kailh pulled out of some drawer. Collaboration with TTC, apparently… not that mechanical switches seem to make much difference with their 0.2mm shorter strokes. Oh, don't be silly - Have a seat. Make yourself comfortable!